If all Brewery Ommegang gave the world was Hennepin, we should consider ourselves lucky. Lately, though, the brewers of that modern classic have also debuted a handful of new seasonals. Just last weekend, for example, the brewery released a New England-style IPA. In cans, at the brewery, with a limit of a case per person. As is tradition. Last fall’s Smoked Porter left us impressed, as did the winter’s Candi Stout and last month’s Double Barrel Dubbel, a decadent sipper aged in bourbon and brandy barrels. Just as those beers were fitting for their respective seasons, the brewery’s latest release seems well-suited for summer. And while we won’t begrudge any brewery for brewing hazy IPAs, Saison Rosé manages to play with trends while hewing a little more closely to the brewery’s Belgian-inspired roots. In this case, that trend is found right in the beer’s name. Over the last year or so, the word “rosé” has migrated out of the wine world and onto the labels of cider, vodka and, yes, beer. Most of these beverages, as you might expect, pour with a pinkish hue. 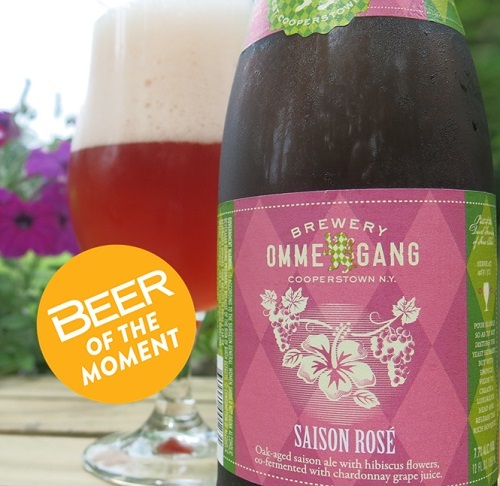 Ommegang’s new saison is no exception, pouring bright ruby and topped with a fluffy pillow of foam. The color in this case is derived from hibiscus flowers, which were added to the saison before it spent time aging with chardonnay grape juice. This beer was later blended with another saison that was aged in oak. Of these ingredients, it’s the chardonnay grape juice that is most apparent. Were you to smell the beer blind, you might think it was actually chardonnay—the aroma is that strong. The grape and a refreshing tartness are the first thing noted on the palate as well, but other fruits join the dance: kiwi, light peach and even a touch of cinnamon, perhaps from the oak. Hibiscus and other flowers can get lost in a beer, especially one in which bolder flavors may overshadow more delicate ones. It’s true that the hibiscus probably impacts the color of this beer more than the flavor, but as the beer warms a floral quality—like a rain-soaked garden—begins to emerge. The beer finishes dry, and strikes the same balance of refreshment and complexity as the aforementioned Hennepin. All said, it’s a complex saison from a brewery that excels at the style. And while Ommegang’s latest seasonals have all been excellent beers, this one manages to play with today’s trends while also maintaining the brewery’s tradition of producing world-class, Belgian-inspired beers. Think you’ve got something good that might fit the bill for Beer of the Moment? Get in touch via @allaboutbeer on Twitter or Instagram, or email us at [email protected].